This article will explain how you can create a mileage claim if you use your own vehicle for business journeys. The personal car mileage module will allow you to create a claim from your business journeys. Click the personal car Mileage icon. 2. You can enter the journey details such as the journey date and category. You should also add a description for the journey and enter your To and From locations. Please note: You can enter locations or you may want to add in postcodes instead (especially if this is part of your company's policy). ExpenseIn uses Google maps to calculate the distance for you. This can be changed by manually amending the distance. There is a handy notes section that you can use to add extra detail to your mileage claim. 3. If you had a return journey, you can tick Return Journey to double the distance. 4. Choose the Rate (per mile) and Vehicle Details from the drop-downs. Once selected, this will be used in subsequent mileage claims. 5. You can attach fuel receipts to your claim by clicking Choose a receipt. If it is a journey that you do on regular basis, you may want to tick Add to favourites. Once the mileage claim is in your favourites, it is really easy to create a claim from it again. Click Create to add that mileage claim to your account. 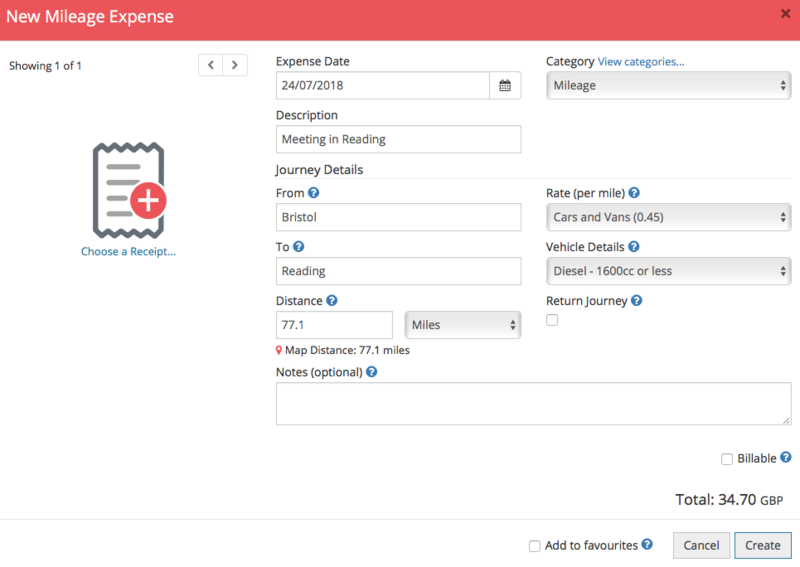 Create a mileage claim (personal car) on your mobile app.